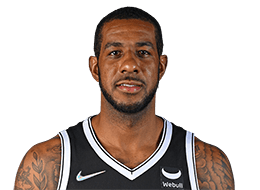 HOW ACQUIRED/DRAFT BACKGROUND: Acquired by Portland from the Chicago Bulls with a future second-round draft pick for Viktor Khryapa and the draft rights to Tyrus Thomas (fourth pick overall) on June 28, 2006. Originally selected by the Bulls in the first round (second pick overall) of the 2006 NBA Draft. 2013-14: Finished the regular season averaging career highs with 23.2 points and 11.1 rebounds, along with 2.6 assists, 0.91 steals, 0.99 blocks and 36.2 minutes in 69 games (all starts) … Ranked eighth in the NBA in scoring and seventh in the league in rebounding … Shot 45.8 percent from the floor and a career-best 82.2 percent from the free throw line … One of three players in the NBA to rank in the top 10 in both scoring and rebounding (Kevin Love, DeMarcus Cousins) … Joined Sidney Wicks as the only other Trail Blazer player to average 23 points and 11 rebounds in a season … Just the fourth Trail Blazer in team history to rank in the top 10 in the NBA in scoring in multiple seasons (Geoff Petrie, Kiki Vandeweghe, Clyde Drexler) … Established a new career high with 40 double-doubles (10th in the NBA) … Selected to his third NBA All-Star Game, the fifth Portland player to be named to at least three All-Star teams (C. Drexler, M. Lucas, B. Roy, S. Wicks) … Led the league in games of 20-plus points and 20-plus rebounds (3) and ranked second in the NBA with 12 games of at least 25 points and 15 rebounds … Named the Western Conference Player of the Week three times (11/18-11/24, 12/2-12/8, 12/9-12/15), one of three Western Conference players to earn the honor at least three times during the season (K. Durant, B. Griffin) … Scored 20-plus points in 11 consecutive games from Jan.4-Jan.25, a career best … Scored a career-high 44 points (15-29 FG) to go along with 13 rebounds and five assists against Denver on Jan. 23, becoming the first Trail Blazer to record at least 44 points and 13 rebounds since Maurice Lucas on 1/12/79 (46 pts., 17 reb.) … Grabbed a career-best 25 rebounds vs. Houston on Dec. 12, adding 31 points … Scored 31 points and notched 15 rebounds, six assists and two blocks at the L.A. Lakers on April 1 ... Finished with 38 points (17-28 FG), 13 rebounds and five assist against Oklahoma City on Dec. 4 ... Led the team in scoring 40 times, rebounding on 38 occasions and twice in assists. 2012-13: Notched averages of 21.1 points (ninth in NBA), career highs of 9.1 rebounds and 2.6 assists, 0.84 steals, 1.23 blocks and 37.7 minutes in 74 games (all starts) … Shot 48.4 percent from the field and 81.0 percent from the free throw line … Just the fourth Trail Blazer in team history to rank in the top 10 in the NBA in scoring multiple seasons (Geoff Petrie, Kiki Vandeweghe, Clyde Drexler) … Only NBA player to average 21.0 points and 9.0 rebounds per game … Ranked 16th in the NBA in rebounds per game and 23rd in blocks per contest … Selected to his second consecutive NBA All-Star Game, the 11th player in franchise history to be selected to an All-Star game multiple times and the eighth to earn the distinction in consecutive seasons … Named NBA Western Conference Player of the Week for the week of March 11-17 … Recorded a career-best 38 double-doubles … Led the NBA with 16 games of 25 points and 10 rebounds and with eight games of at least 30 points and 10 boards … Led the team in scoring 29 times, in rebounds 31 times and in assists on six different occasions … Tallied a double-double in seven straight games from Jan. 27-Feb. 8, a new career long double-double streak … Made the game-winning shot as time expired against Dallas on Jan. 29, a 106-104 victory … Set a career high with eight assists vs. Atlanta on Nov. 12 … Finished with 30 points (12-23 FG) and 21 rebounds against Golden State on April 17, joining Maurice Lucas as the only Trail Blazers in team history with two career 30-point, 20-rebound games … Scored a season-high 33 points (15-of-26 FG) and added 11 rebounds Jan. 13 vs. Oklahoma City. NBA CAREER: Has career averages of 19.2 points (48.8% FG, 78.8% FT), 8.3 rebounds, 2.0 assists, 1.02 blocks and 35.5 minutes in 577 games (536 starts) … Led team in scoring 215 times and rebounding 207 times in 577 career games … Scored 20 points or more on 282 occasions … Ranks second in franchise history in field goals made (4,462), third in points scored (10,901), fourth in defensive rebounds (3,150), offensive rebounds (1,559) and minutes played (20,460) and fifth in total rebounds (4,709) and free throws made (1,953) … 2012-13: Notched averages of 21.1 points (ninth in NBA), 9.1 rebounds, 2.6 assists, 0.84 steals, 1.23 blocks and 37.7 minutes in 74 games (all starts) … Shot 48.4 percent from the field and 81.0 percent from the free throw line … Only NBA player to average 21.0 points and 9.0 rebounds per game … Ranked 16th in the NBA in rebounds per game and 23rd in blocks per contest … Selected to his second consecutive NBA All-Star Game … Named NBA Western Conference Player of the Week for the week of March 11-17 … Recorded 38 double-doubles … Led the NBA with 16 games of 25 points and 10 rebounds and with eight games of at least 30 points and 10 boards … Led the team in scoring 29 times, in rebounds 31 times and in assists on six different occasions … Tallied a double-double in seven straight games from Jan. 27-Feb. 8, tied for his longest double-double streak of his career … Made the game-winning shot as time expired against Dallas on Jan. 29, a 106-104 victory … Set a career high with eight assists vs. Atlanta on Nov. 12 … Finished with 30 points (12-23 FG) and 21 rebounds against Golden State on April 17 … Scored a season-high 33 points Jan. 13 vs. Oklahoma City … 2011-12: Posted averages of 21.7 points (seventh in NBA), 8.0 rebounds, 36.3 minutes (all team highs), 0.93 steals, 0.82 blocks, and 2.4 assists in 55 games (all starts) … Earned his first career NBA All-Star Game selection … Became the first Trail Blazer to finish in the NBA’s top seven in scoring since Clyde Drexler placed fourth in 1991-92 ... Only the sixth Trail Blazer to finish in the top 10 in scoring in a season (Geoff Petrie, Sidney Wicks, Kiki Vandeweghe, Clyde Drexler, Brandon Roy) … Was one of three players in the NBA to average at least 21.7 points per game and shoot at least 50 percent from the field (LeBron James and Kevin Durant were the other two) … Became the first player in team history to record 33 points and 23 rebounds in the same game Jan. 20 at Toronto ... Missed the last eight games of the season with a hip ailment … Underwent successful surgery on right hip on April 12 … 2010-11: Averaged a team-high 21.8 points (50.0% FG, 79.1% FT) to go with 8.8 rebounds, 2.1 assists, 1.01 steals, 1.16 blocks and 39.6 minutes in 81 games (all starts) … One of three NBA players to rank in the top 15 in points (14th) and rebounds (14th) … Finished third in the NBA in minutes per game (39.6) … Named to the All-NBA Third Team … His 36 double-doubles led the team … Named Western Conference Player of the Month for February, becoming the third Trail Blazer ever to win the award (Clyde Drexler, 1991 and Kelvin Ransey, 1981) ... Joined Clyde Drexler and Brandon Roy as the only Trail Blazers to win Western Conference Player of the Week twice in one season (Jan. 17-23, Feb. 7-13) … Became the first Trail Blazer to record three straight games of 36 points or more (42, Feb. 7 vs. Chicago, 37, Feb. 11 at Toronto and 36, Feb. 13 at Detroit) ... Scored a career-high 42 points and tied a career high with 12 free throws vs. Chicago on Feb. 7 ... Netted 40 points and a career-high 16 field goals, adding 11 rebounds Feb. 1 vs. San Antonio ... Became the first Trail Blazer to score at least 25 points and grab 10 rebounds in five straight games (Jan. 2-9) ... 2009-10: Averaged 17.9 points (49.5% FG, 75.7% FT), 8.0 rebounds, 2.1 assists, 0.86 steals and 37.5 minutes in 78 games (all starts) … Averaged a team-best 19.7 points in last 44 games ... Led team with 24 double-doubles … Netted a season-best 32 points on 15 field goals (of 23) Feb. 26 at Chicago ... Scored 15-plus points 18 straight games Jan. 18-Feb. 23 … 2008-09: Averaged 18.1 points (48.4% FG, 78.1% FT) to go with 7.5 rebounds, 1.9 assists, 0.95 steals, 0.95 blocked shots and 37.1 minutes in 81 games (all starts) … Ranked first on the team and tied for eighth among league qualifiers with 2.9 offensive rebounds per game … 2007-08: Posted averages of 17.8 points, 7.6 rebounds, 1.6 assists and 34.9 minutes in 76 games (all starts) … Led the team and all NBA sophomores with 19 double-doubles ... Ranked 26th in the NBA in blocked shots with a team-best 1.24 per game … Finished 29th in the NBA in rebounds and No. 1 among sophomores at 7.6 per game … Started in the T-Mobile Rookie Challenge at All-Star Weekend in New Orleans, where he led the Sophomores with 18 points (9-17 FG) and a team-high nine rebounds (six off.) … 2006-07: Averaged 9.0 points, 5.0 rebounds and 1.16 blocks in 22.1 minutes … Shot 50.3 percent from the floor … Appeared in 63 games (22 starts) … Named to T-Mobile NBA All-Rookie First Team … Tied for second on the team and placed third among NBA rookies with six double-doubles … Ranked first among NBA rookies in blocks per game, fourth in rebounds, seventh in scoring, fourth in field goal percentage and eighth in minutes … Logged three consecutive double-doubles from March 13-16, marking the first time that had been accomplished by a Trail Blazers rookie since Arvydas Sabonis tallied six straight in 1995-96 … Sat out the first five games of the season recovering from surgery on his right shoulder, performed on Aug. 23, 2006 … Missed the last nine games of the season with what was diagnosed as Wolf-Parkinson-White Syndrome; underwent a successful procedure on April 9. PLAYOFFS: Played in 18 career postseason games (all starts) for the Trail Blazers, averaging 19.8 points (46.2% FG), 7.0 rebounds, 1.72 blocks and 40.2 minutes ... 2011: Led team with 20.8 points to go with 7.5 rebounds, 1.3 assists, 1.33 steals and 1.67 blocks in 43.0 minutes vs. Dallas ... Netted 20 points or more in four games ... Led team in scoring twice and rebounding twice ... 2010: Led team in scoring (19.0), steals (1.17, tied), blocks (1.83) and minutes (38.2), and ranked second in rebounds (6.0) in six games (all starts) against Phoenix ... His 1.83 blocks were eighth-most by a Trail Blazer in a postseason, all-time ... Posted a playoff career-high 31 points (11-19 FG, 9-12 FT) to go with 11 rebounds April 24 vs. Phoenix, becoming first Trail Blazer to tally at least 30 points, 10 rebounds and shoot 50 percent from the field in a playoff game since Kevin Duckworth on May 12, 1991 ... 2009: Started all six of Portland’s games, averaging 19.5 points (49.0% FG), a team-best 7.5 rebounds, 1.67 blocks and 39.5 minutes vs. Houston ... Netted 20-plus points in three games ... Led team in rebounding on three occasions. PLAYOFFS: Played in 18 career postseason games (all starts) for the Trail Blazers, averaging 19.8 points (46.2% FG), 7.0 rebounds, 1.72 blocks and 40.2 minutes … 2011: Led the team with 20.8 points to go with 7.5 rebounds, 1.3 assists, 1.33 steals and 1.67 blocks in 43.0 minutes vs. Dallas … Netted 20 points or more in four games … Led the team in scoring twice and rebounding twice … 2010: Led team in scoring (19.0), steals (1.17, tied), blocks (1.83) and minutes (38.2), and ranked second in rebounds (6.0) in six games (all starts) against Phoenix ... Posted a playoff career-high 31 points (11-19 FG, 9-12 FT) to go with 11 rebounds April 24 vs. Phoenix, becoming the first Trail Blazer to tally at least 30 points, 10 rebounds and shoot 50 percent from the field in a playoff game since Kevin Duckworth on May 12, 1991 … 2009: Started all six of Portland’s games, averaging 19.5 points (49.0% FG), a team-best 7.5 rebounds, 1.67 blocks and 39.5 minutes vs. Houston … Netted 20-plus points in three games. COLLEGE: Averaged 13.5 points (59.7% FG), 8.2 rebounds, 1.3 steals and 1.8 blocks in 53 games with the Longhorns from 2004-06 ... Counted 15.0 points, 9.2 rebounds and 2.0 blocks in his second and final season, ranking second on team in scoring and first in blocks ... Named Big 12 Defensive Player of The Year and First Team All-Big 12 as a sophomore in 2005-06 ... Earned Third Team NABC All-America honors and Associated Press Honorable Mention All-America honors as a sophomore ... Led the country in field goal percentage (66.3%) as a freshman in 2004-05.